Who thought putting Dynasty Warriors in an open world would be a good idea? I think my Dynasty Warriors experience is a pretty common one. I fiddled with a few of the games during the PlayStation 2 era, mostly because I had friends who were into their hacking-and-slashing spectacle, but never clicked with its mindless monotony and military melodrama enough to become a devotee. But as tends to happen on the internet, the series, which basically became a punchline as the numbers at the end of its titles crept closer and closer to double digits, has seen some redemptive retrospection, partly fueled by successful spin-offs like Hyrule Warriors and Attack On Titan. With those good vibes and Koei Tecmo positioning Dynasty Warriors 9 as a soft reboot in mind, I wanted to give this newest entry a shot. After all, I’ve spent most of my gaming time this year with the heady and demanding Monster Hunter: World, so a little braindead button mashing would be a nice change of pace. So far, though, this game is feeling like enough of a mess that I’m pretty certain the series would’ve been better off continuing to stagnate than trying out this new direction. 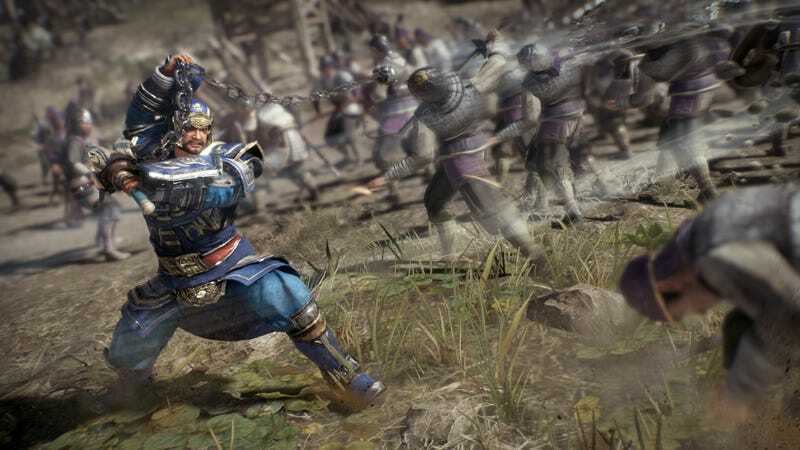 Dynasty Warriors 9’s solution was, as is almost always the case these days, to take the series’ action and plunk it into a humongous, ugly open world. You still pick from tons of playable characters in different factions. (You start with three, but quickly begin to unlock more.) You still cut down hundreds of enemy troops without breaking a sweat. You still see little heads of friends and foes pop up on the screen, delivering the same soundbites over and over. You still have a horse that’s a massive idiot and glitch magnet. Now there’s also a rudimentary Assassin’s Creed clone—with tower climbing, resource collecting, item crafting, and side questing—jammed between all the action. In a show of mercy that also seems like a tacit acknowledgment that maybe this open world is just getting in the way, at least you can sometimes fast-travel straight to the battles. I’ve long had a policy of playing everything Harmonix puts out, but they’ve gotten a little harder to follow over the years. At first, the Boston-based studio produced its own peripherals, which led to several apartments being littered with tiny plastic instruments for years on end. When it made a game for the poor, beleaguered Kinect, I found myself with the requisite equipment and shamelessness to properly enjoy it, generally in the company of jeering friends and roommates. But I got an Xbox One after they ditched the Kinect, meaning I couldn’t play their supposedly excellent Fantasia: Music Evolved, and the studio’s investment in VR has sundered our relationship entirely. I’m sure the projects they’ve made for PSVR, Oculus Rift, and Gear VR are all excellent, but I have no way of knowing. So I was excited to see a review copy of their newest effort, DropMix, show up at A.V. Club HQ courtesy of Hasbro. It’s a big chunky piece of plastic—solid but toy-like, just like the old Guitar Hero stuff—that runs on your smartphone. You play it by laying down cards with various song names on them, each element separated in the mix. So: Here’s the guitar line from Bruno Mars’ “24K Magic,” here are the drums from CHVRCHES’ “The Mother We Share,” here’s the horn line from Cake’s “Short Skirt/Long Jacket.” The app has a few different modes—two-team clashes, request-based party mode, and a no-rules freestyle mode—but all of them are generally centered around playing with the big chunk of plastic and seeing what it does. The fun with something like this comes in trying to stump it, to create something it can’t pull off, but it typically defies the odds, fading in new elements masterfully, shifting pitch and tempo as appropriate, and creating a generally seamless, programmatic mashup that could hang with most of the stuff that makes the rounds online.